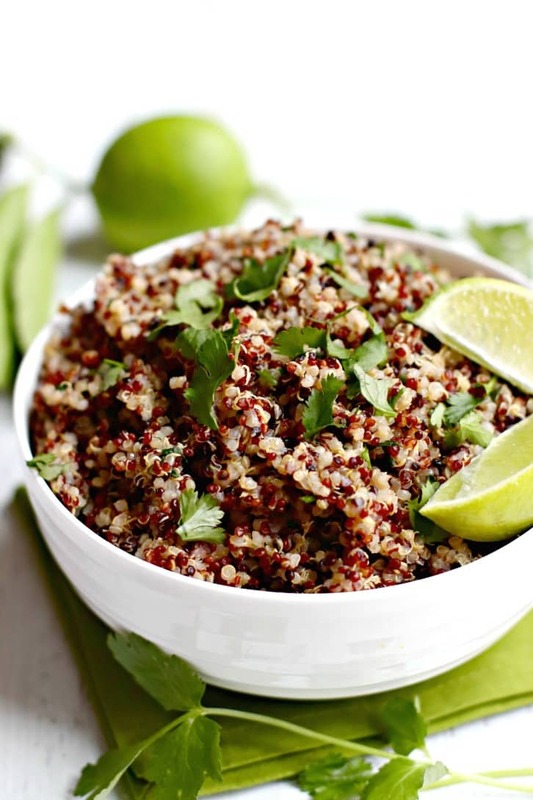 Cilantro Lime Quinoa is easy to make on the stove or in an Instant Pot pressure cooker. It’s vegan, gluten-free, and oil-free. Enjoy it as a side with your favorite Mexican dishes or in a bowl with beans and vegetables. 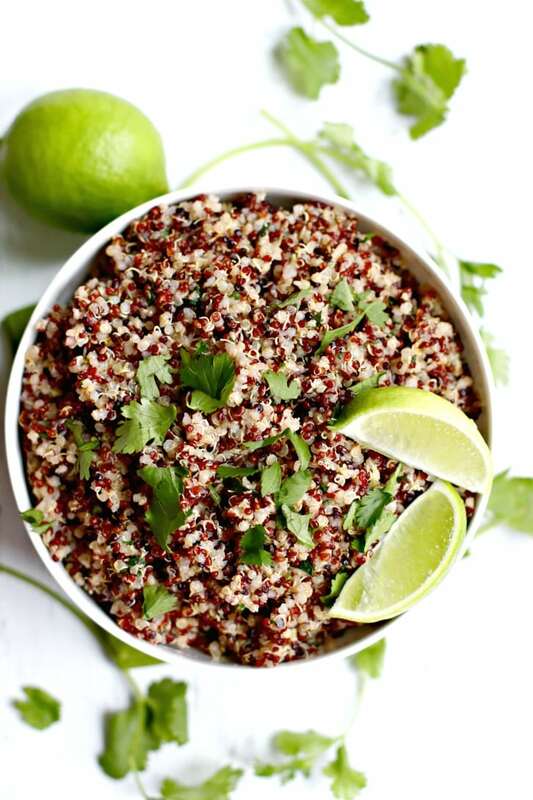 You may have eaten Cilantro Lime Rice, but have you ever tried Cilantro Lime Quinoa? Quinoa is a wonderful whole grain to add to your diet. Besides being gluten-free, it’s very nutritious. In fact, while brown rice and quinoa contain about the same amount of carbohydrates per serving, quinoa contains more protein and dietary fiber. This means that it will help you stay fuller longer. Plus I love the texture and nutty flavor of the grain-like seeds. 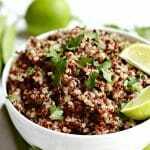 My favorite way to make Cilantro Lime Quinoa is in the Instant Pot. Just add the rinsed and drained quinoa to the pot with some liquid, set the timer, and walk away. The pressure releases naturally, and you can keep it warm as long as you like. But don’t worry if you don’t have an Instant Pot. Cooking quinoa on the stove requires very little work and only a few more minutes. 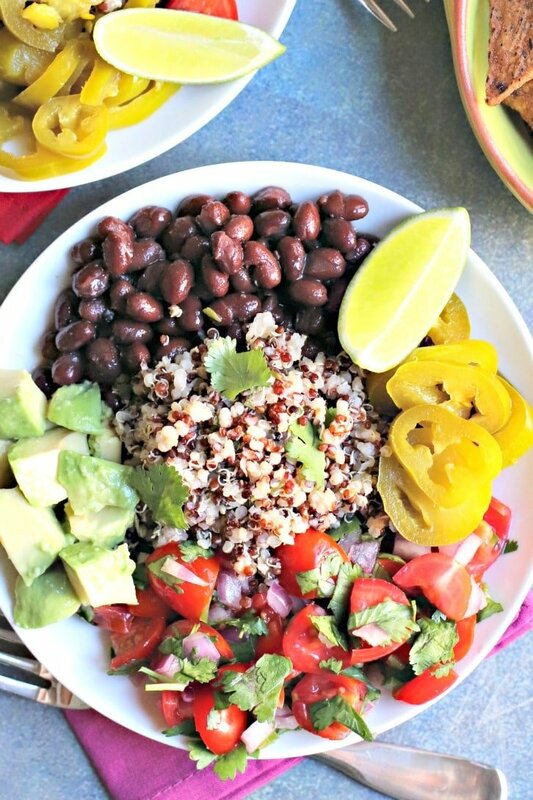 I love adding Cilantro Lime Quinoa to burrito bowls or enjoying it as a side dish with tacos. It’s delicious eaten hot or at room temperature. Sometimes I’ll have it as a quick meal with some beans, greens, and salsa. Or I put some of the quinoa in a bowl and top it with Jackfruit & Black Bean Taco Filling, shredded cabbage, tomatoes, and guacamole. And you can use it to make Quinoa Burrito Bowls. Now let’s make Cilantro Lime Quinoa! 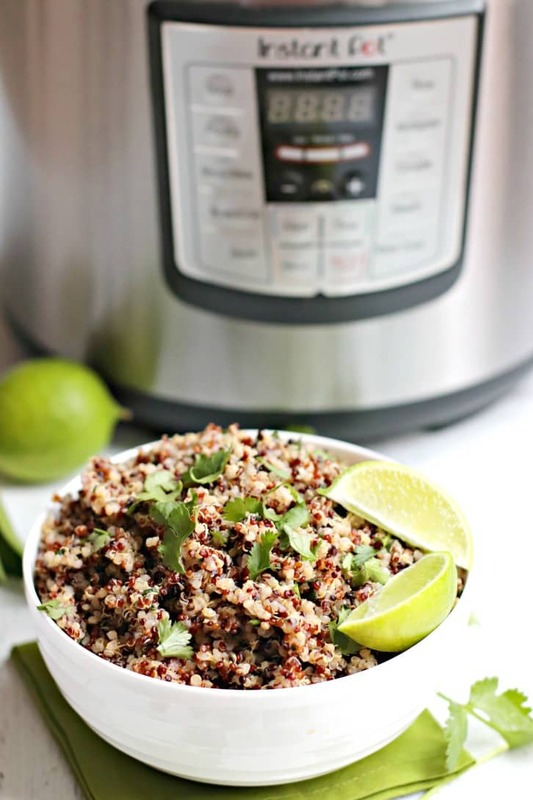 Cilantro Lime Quinoa is easy to make on the stove or in an Instant Pot pressure cooker. It's vegan, gluten-free, and oil-free. Enjoy it as a side with your favorite Mexican dishes or in a bowl with beans and vegetables. Add the quinoa and 1 1/4 cup vegetable broth to the Instant Pot. Close the lid and select the manual button. Set the timer for 5 minutes. When the 5 minutes is up, allow the pressure to release naturally. Once the pressure has been released, remove the lid and stir in the lime juice, lime zest, and cilantro. Taste and add salt, as desired. Add the quinoa and 2 cups vegetable broth to a 2-quart sauce pan and bring to a boil. Cover the pot and lower the heat to low. Simmer for 15 minutes with the lid on. After 15 minutes, remove the pot from the heat. Keep covered and allow to rest for 5 minutes. Remove the lid and stir in the lime juice, lime zest, and cilantro. Taste and add salt, as desired. Another great use for my 3qt IP. Really enjoyed this combo. I used water instead of broth since I didn’t have any but I didn’t miss it – especially with all the lime goodness. I’ll make it this way again. Yum! Thank you, Linda! I’m so happy you enjoyed it! Brilliant! We only use quinoa (no rice) and it’s never occurred to me to cook it in my IP. Planning to make this as a side for our taco soup tonight. Do you suppose I can double this with good results? Thanks Morgan! Yes, you can double the recipe. The cooking time will be the same, but the time to come up to pressure will be a little longer with the larger quantities. How long can the quinoa be stored. I am planning to meal prep and was wondering if I made it this Weekend to take for lunch later this week, will it be alright? Hi Kiran, it will last for a week in the refrigerator. Enjoy!